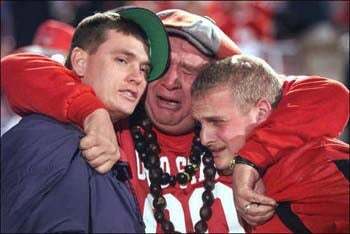 Hey, Tommy Bowden's departure from Clemson was hard on all of us. But none moreso than Dave of Mount Pleasant, who called in to the Live 5 News sports report and tried to be brave, but dammit, he's been torn up ever since he heard the news, and now he's afraid that ... the whole program (gulp) is in shambles (breaks down, weeps). After the jump, witness one man's descent into the pit of despair, feel his pain, and see the sports anchors who try their darndest not to laugh at that man.